What’s a journey you are on right now and what excites you most about it? As many college students and recent college graduates know, being asked, “What do you want to do for a living?” can be extremely daunting. For me, though, that wasn’t the case. I always knew I wanted to work with children with disabilities. My younger brother, Benjamin, has Cerebral Palsy, a physical disability that affects a person’s movement and is marked by impaired muscle coordination. Watching the physical therapists who worked diligently to ensure he reached his full potential made me want to follow in their career paths and make an impact in the lives of children with disabilities. When I started college, I began to take the courses I would need to become a physical therapist, but as my freshman year progressed, the science courses became extremely difficult. I began to explore other options and on a whim took an education course. For my remaining two years at college, I became extremely involved in the local school district. 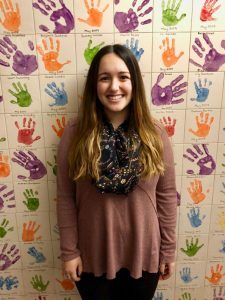 During my junior year, I interned in an inclusive preschool classroom, where students with and without disabilities are taught together by a general education and special education teacher. 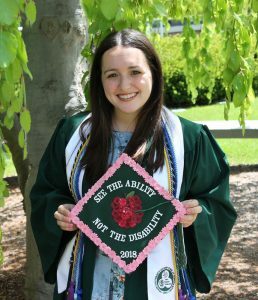 After my internship ended, the special education teacher helped me get a job as a 1-1 aide in another inclusive preschool classroom, assisting a little girl with Down Syndrome. 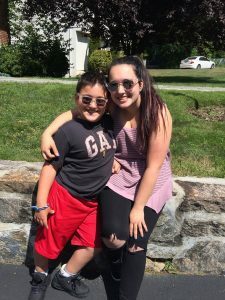 While that experience cemented my desire to work as a special education teacher, I still felt as if there was something missing. Soon after I graduated, I was presented with two incredible opportunities: The first, to work as a preschool teacher at Beth El Nursery School, a preschool in New Rochelle, and the second, to be a resource teacher at Shorashim Hebrew School at Temple Israel of White Plains. I soon realized that what was missing from my teaching jobs during college was being a part of the Jewish community. Having Jewish values, themes and holidays woven into my school community has been vital to my development both personally and professionally. Through my jobs, I have become more connected with my own Judaism and have gained so much pride in my identity as a Conservative Jew. I’ve begun to bake challah every week for my Shabbat dinner and seek out opportunities to become more involved in my Jewish community. Until I started working in Jewish education, I did not realize the strong connection I would feel with my role. I get to help instill strong Jewish values and a love for Judaism into my students through singing Jewish songs, celebrating Kabalat Shabbat and holidays and baking challah in school. Juggling being a full-time Master’s student at Hunter College with teaching has kept me busy and at times can be stressful, but being surrounded and supported by strong Jewish women has not only given me a sense of community, but has also given me role models. As I continue in graduate school to get my teaching certification, I cannot wait to see where the journey takes me. Have you or someone you know found meaning in life through Judaism? If so, email us at journeys@uscj.org. to tell us your story for consideration in a future The Road Traveled column.